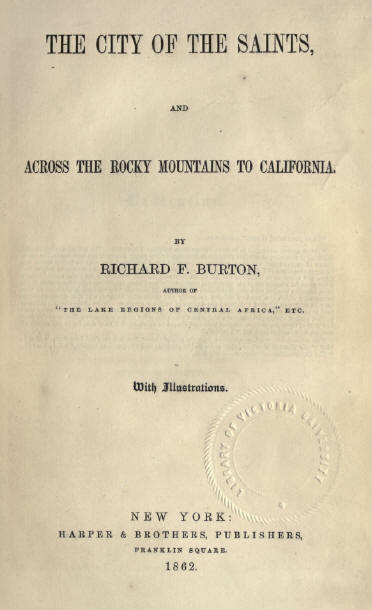 First American edition of 1862. New York: Harper and Brothers Publishers. Unaccustomed, of late years at least, to deal with tales of twice-told travel, I can not but feel, especially when, as in the present case, so much detail has been expended upon the trivialities of a Diary, the want of that freshness and originality which would have helped the reader over a little lengthiness. My best excuse is the following extract from the lexicographer's "Journey to the Western Islands," made in company with Mr. Boswell during the year of grace 1773, and upheld even at that late hour as somewhat a feat in the locomotive line. "These diminutive observations seem to take away something from the dignity of writing, and therefore are never communicated but with hesitation, and a little fear of abasement and contempt. But it must be remembered that life consists not of a series of illustrious actions or elegant enjoyments; the greater part of our time passes in compliance with necessities, in the performance of daily duties, in the removal of small inconveniences, in the procurement of petty pleasures, and we are well or ill at ease as the main stream of life glides on smoothly, or is ruffled by small obstacles and frequent interruptions." True! and as the novelist claims his right to elaborate, in the domestic epic," the most trivial scenes of household routine, so the traveler may be allowed to enlarge, when copying nature in his humbler way, upon the subject of his little drama, and, not confining himself to the great, the good, and the beautiful, nor suffering himself to be wholly engrossed by the claims of cotton, civilization, and Christianity, useful knowledge and missionary enterprise, to desipere in loco by expatiating upon his bed, his meat, and his drink. The notes forming the ground-work of this volume were written on patent improved metallic pocket-books in sight of the ob jects which attracted my attention. The old traveler is again right when he remarks: "There is yet another cause of error not always easily surmounted, though more dangerous to the veracity of itinerary narratives than imperfect mensuration. An observer deeply impressed by any remarkable spectacle does not suppose that the traces will soon vanish from his mind, and, having commonly no great convenience for writing"-Penny and Letts are of a later date---" defers the description to a time of more leisure and better accommodation. He who has not made the experiment, or is not accustomed to require rigorous accuracy from himself, will scarcely believe how much a few hours take from certainty of knowledge and distinctness of imagery; how the succession of objects will be broken, how separate parts will be confused, and how many particular features and discriminations will be found compressed and conglobated with one gross and general idea." Brave words, somewhat pompous and diffused, yet worthy to be written in letters of gold. But, though of the same opinion with At. Charles Didier, the Miso-Albion (Sejour chez le Grand-Cherif do la Mekkeh, Preface, p. vi. ), when he characterizes "un voyage de fantaisie" as "Ie pire de tons lea roman," and with Admiral Fitzroy (Hints to Travelers, p. 3), that the descriptions should be written with the objects in view, I would avoid the other extreme, viz., that of publishing, as our realistic age is apt to do, mere photographic representations. Byron could not write verse when on Lake Leman, and the traveler who puts forth his narrative without after-study and thought will produce a kind of Persian picture, pre-Raphaelitic enough, no doubt, but lacking distance and perspective-in artists' phrase, depth and breadth-in fact, a narrative about as pleasing to the reader's mind as the sage and saleratus prairies of the Far West would be to his ken. In working up this book I have freely used authorities well known across the water, but more or less rare in England. The books principally borrowed from are "The Prairie Traveler," by Captain Many; "Explorations of Nebraska," by Lieutenant G. A. Warren; and Mr. Bartlett's "Dictionary of Americanisms." To describe these regions without the aid of their first explorers, Messrs. Fremont and Stansbury, would. of course have been impossible. If I have not always specified the authority for a statement, it has been rather for the purpose of not wearying the reader by repetitions than with the view of enriching my pages at the expense of others. In commenting upon what was seen and beard, I have endeavored to assume-whether successfully or not the public will deeide-the cosmopolitan character, and to avoid the capital error, especially in treating of things American, of looking at them from the fancied vantage-ground of an English point of view. I hold the Anglo-Scandinavian* of the New World to be in most things equal, in many inferior, and in many superior, to his cousin in the Old; and that a gentleman, that is to say, a man of education, probity, and honor-not, as I was once told, one who must get on onner and onnest-is every where the same, though living in separate hemispheres. If, in the present transition state of the Far West, the broad lands lying between the Missouri River and the Sierra Nevada have occasionally been handled somewhat roughly, I have done no more than I should have permitted myself to do while treating of rambles beyond railways through the semi-civilized parts of Great Britain, with their "pleasant primitive populations"-Wales, for instance, or Cornwall. Finally, I would again solicit forbearance touching certain errors of omission and commission which are to be found in these pages. Her most gracious majesty has been pleased to honor me with an appointment as Consul at Fernando Po, in the Bight of Biafra, and the necessity of an early departure has limited me to a single revise. * The word is proposed by Dr. Norton Shaw, Secretary to the Royal Geographical Society, and should be generally adopted. Anglo-Saxon is to Anglo-Scandinavian what Indo-Germanic is to lade-European; both serve to humor the absurd pretensions of claimants whose principal claim to distinction is pretentiousness. The coupling England with Saxony suggests to my memory a toast once proposed after a patriotic and fusional political feed in the Isle of the Knights- "Malta and England united can conquer the world."